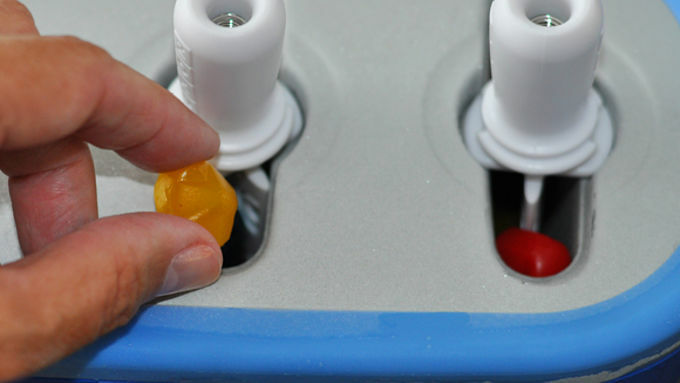 Place a few Gushers into each mold of the frozen Zoku™ maker. Add a handle to each mold. Add as many more Gushers as you are able to, trying to finagle some around to the sides so they are evenly placed. (Or placing them just along the sides is fine, too.) Use the handle of a wooden spoon to help push the Gushers down into the molds. Pour the Sprite into the Zoku™ molds, just up to the marked fill line. 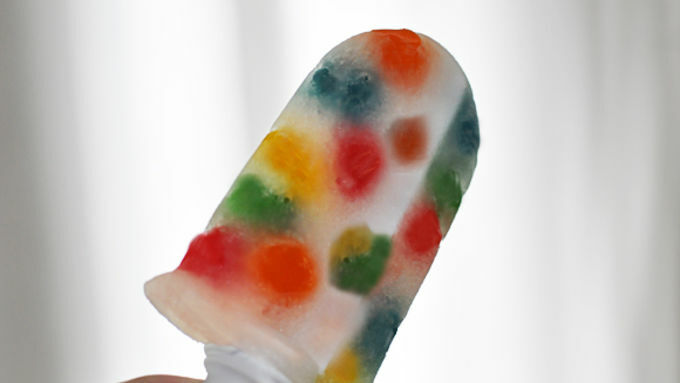 Allow pops to freeze on the countertop for about 10 minutes (more if they are not yet visually frozen throughout). Use the Zoku™ quick release handle to remove each pop from the mold. Enjoy immediately! This recipe uses a Zoku™ Quick Pop Maker, which must be placed in the freezer 24 hours ahead of use. This recipe assumes the maker is already frozen for the required time. 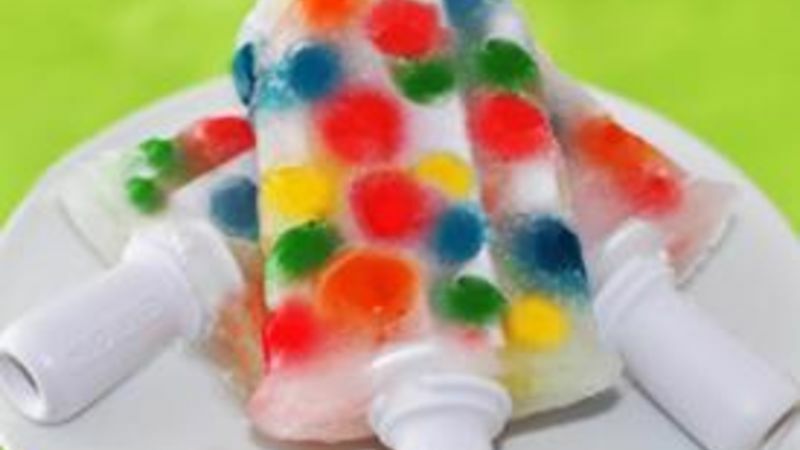 Polka dots rock these sweet pops made super fast in a Zoku Quick Pop Maker! I was at a wedding once where nearly all the dancing was to polka music. Oh, you're not from Wisconsin? Hmmm. This story may not be so relevant then. If you won't do the polka dance, no worries. You can still do the polka dot. I'll show you how. I've been making Zoku pops for awhile now -- I'm kind of a Zoku guru, you could say -- so stick with me and nobody will get hurt (polka dancing). You need just a couple things: Sprite and Gushers Fruit Snacks...and A Zoku Quick Pop Maker. I used a few different flavors of Gushers to get a bunch of varied colors, but you go ahead and use whatever ones you feel like. If you've used a Zoku before you know that you have to freeze the pop maker for 24 hours before you use it. No biggie, really, considering that then your pops will freeze before your li'l eyeballs in just minutes. It's like food entertainment, it is. 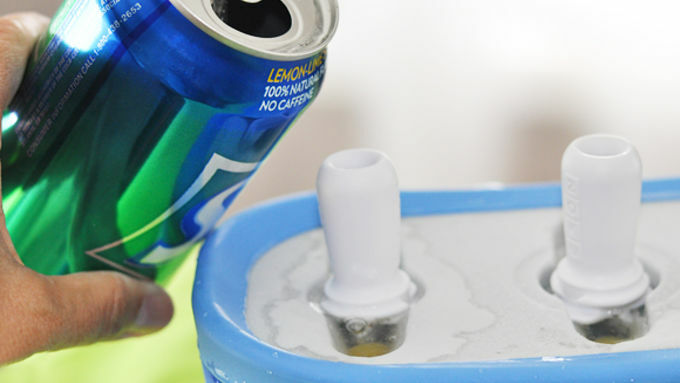 When they're totally frozen, grab the handy dandy pop release tool and twist it right onto one of the handles. Then wiggle and jiggle it 'til it loosens up -- not unlike polka dancers, I might add. Pop! Out they come. Yep, it's really that easy. Hand 'em out right away because they're best like that. And now you can say that you know the polka -- sorta.